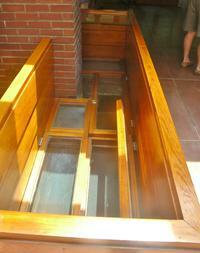 After entering through what seems like a small door, the public spaces in the house open up dramatically. 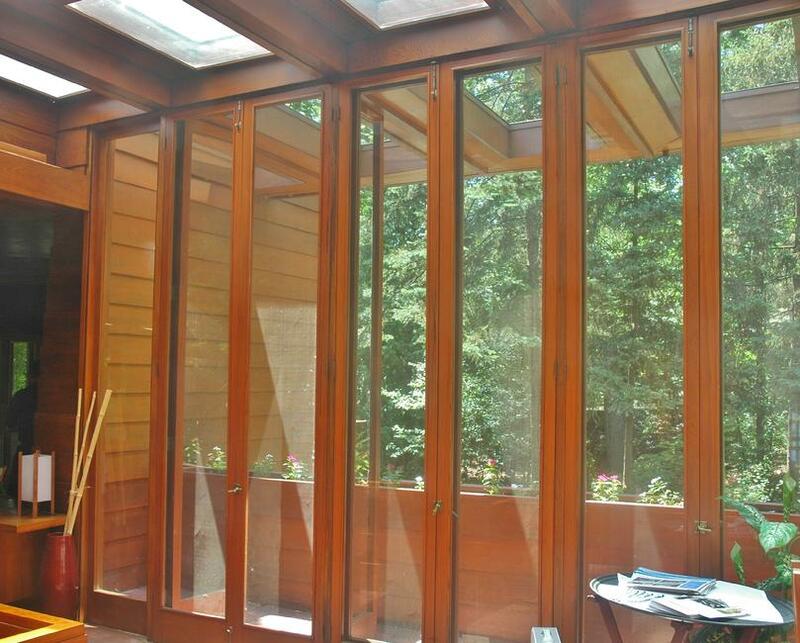 Interior and exterior materials are the same Tidewater Cypress, which create a rich and warm color and atmosphere. 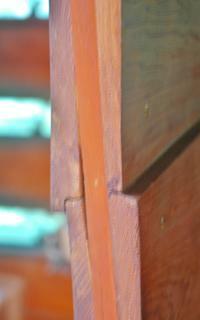 The interior Cypress does appear warmer in that it is finished with a gloss shellac. While the Cypress itself is exceedingly stable and durable, unfinished wood attracts dust and would not be suitable for interior uses. Proceeding through the entry to the East, one enters the main public room in the house, a large Living / Dining room with the long dimensions running to the North and South. Then entire East and South faces are glass with multiple access to the adjacent continuous patio / deck wrapping both the East and South sides of the room. 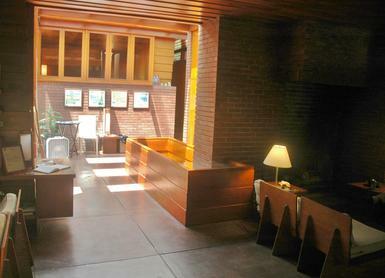 The fireplace is visible to the left in this photo, just past the connection to the entry foyer. 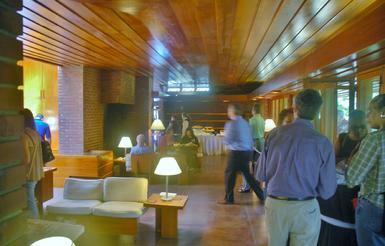 The kitchen is at left in this photo as well at the extreme North end of this room. Looking to the West from the Living / Dining Room back into the entry foyer. The knee wall to the right houses operable windows that open to below the house. 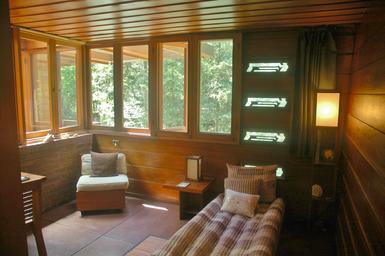 When the stream was functional, opening these windows provided a source of natural cooling. Turning right from the entry one ascends a short flight of stairs up one half level to the private portion of the house. 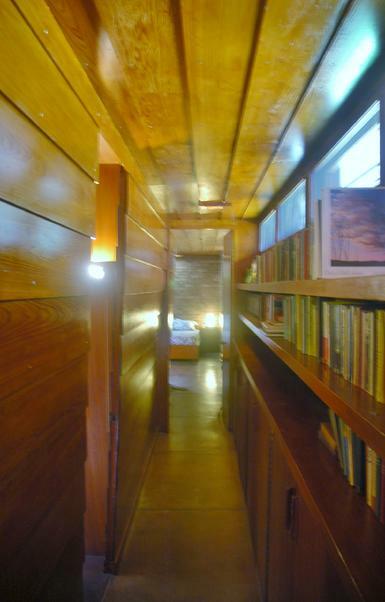 At the top of the stairs is a narrow corridor leading to the West. Bedrooms are to the left, with the Master Bedroom at the extreme West end. 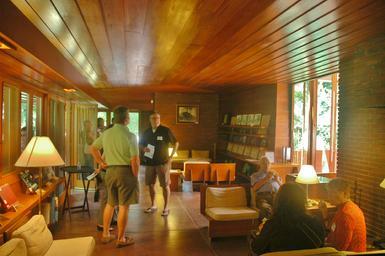 The floors are the same colored concrete used throughout the house. 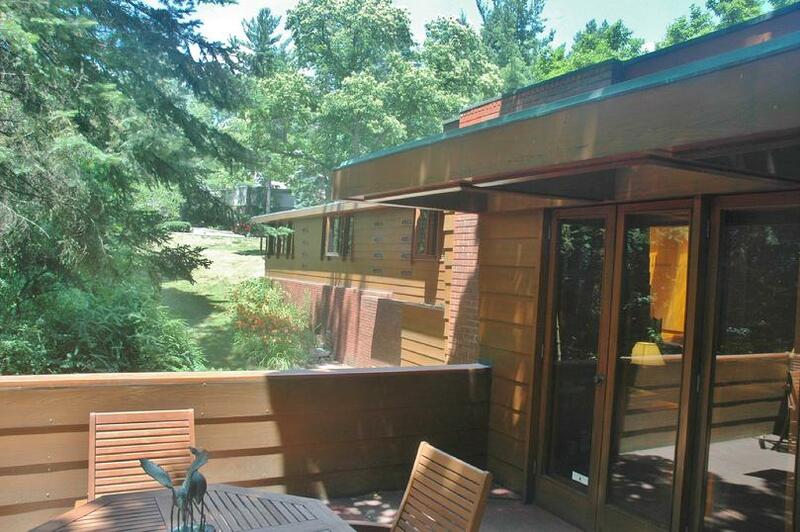 Despite the use of concrete directly on the earth subgrade - or concrete exposed to the elements, the house and slabs are comfortable in winter as the slabs are heated with a internal hydronic (hot water) system, a signature in Usonian houses. The lack of cooling is evident however. Addressing the need to integrate a cooling system into the house without affecting the aesthetics is a goal of the restoration process, which will be addressed as the work proceeds to the interior. The corridor seems narrow and low because it is. The Wright reluctance to use valuable space for things such as corridors and bathrooms is evident here. Building to today's codes with minimum corridor widths and minimum ceiling heights would deprive the house of the close and intimate atmosphere it enjoys as a consequence of this approach. Between the first and second bedroom is a full Bath that isn't accessed from the corridor, but is accessed from each of the smaller Bedrooms. 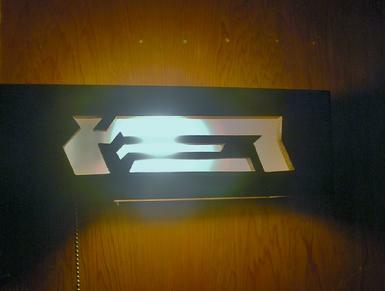 Again, note the stylized "A" windows. 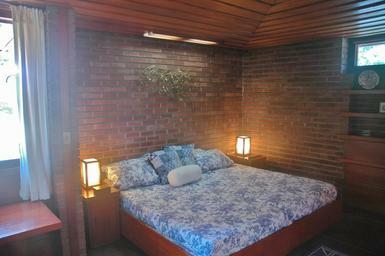 The second Bedroom to the West is markedly smaller than the first. 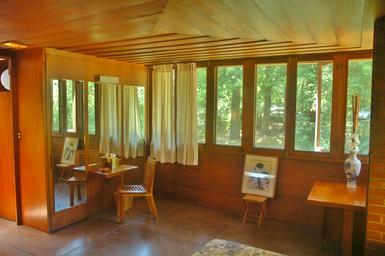 Wright paid close attention to finish details. 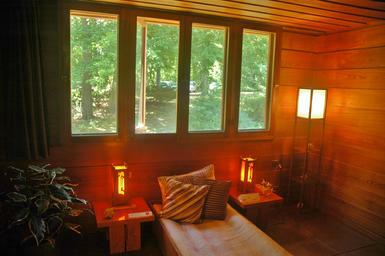 Interior partitions are constructed with 3/4 plywood edged with solid cypress planking. The same cypress siding that is used for both interior and exterior finish is applied on both sides. Interior doors are constructed in the same manner (note the hardware is too wide to fit fully within the 3/4 inch thickness of the interior plywood panel and the latch plate extends into the thickness of the siding on one side). 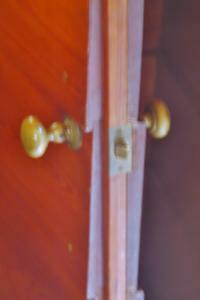 No trim or casing is applied such that when doors are closed, other than the door knob, they simply appear to be a continuous part of the wall. 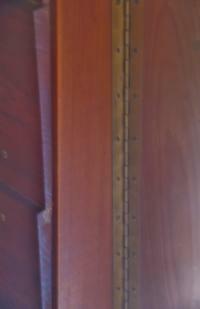 Doors are mounted on continuous brass piano hinges. 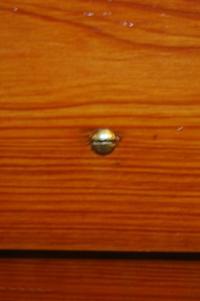 Interior and exterior siding is secured with thousands of exposed brass screws. Screws are placed in meticulous vertical alignment and turned such that all screw head slots are aligned horizontally. 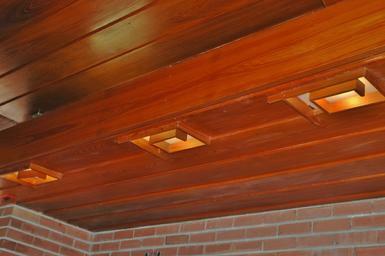 Screws fastening ceiling panels are turned so that all screw head slots are aligned North and South. A view inside the knee wall in the entry foyer which encloses and protects the windows that open to expose the cooling effect of the breeze below. 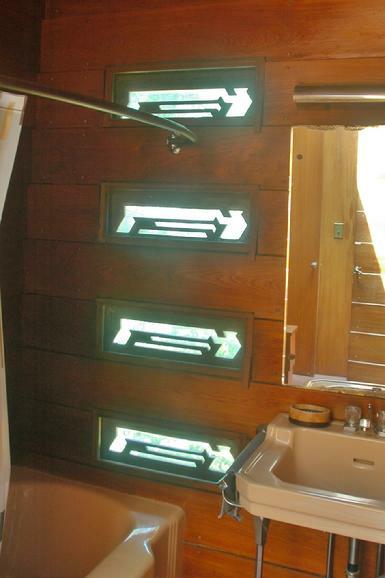 This window assembly is directly over what used to be the stream described in other pages. 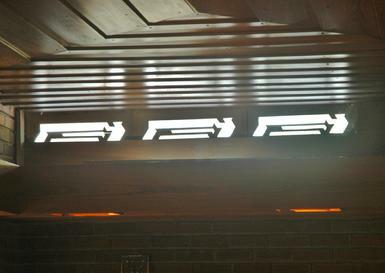 Soffits surrounding the Dining / Living Room also house the light sources. Although the back lit openings do create background lighting, task lighting is still necessary. Developing a method for integrating additional lighting that will allow for use of the space for meetings and conferences without affecting the design is a task that lies in the restoration efforts. Portable indirect fixtures that can be stored when not in use are being considered, and the electrical system upgrade will allow for that approach.